Treating a patient with a superficial bladder tumour has responsibilities far beyond performing a good TUR of the tumour. 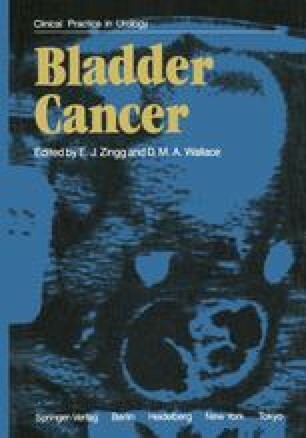 Choosing the optimum treatment policy for the patient depends on the urologist having a wide understanding of the disease, a sound knowledge of bladder tumour pathology and a critical appraisal of all the therapeutic modalities available. Treatment is likely to be prolonged over many years, and the follow-up is an essential part of this treatment. The urologist must set out prepared to use all the available forms of treatment, including intravesical chemotherapy and total cystectomy. If he is not, the patient should be referred on at an early stage, rather than persist with ineffective treatment for this may deny the patient the opportunity of cure.